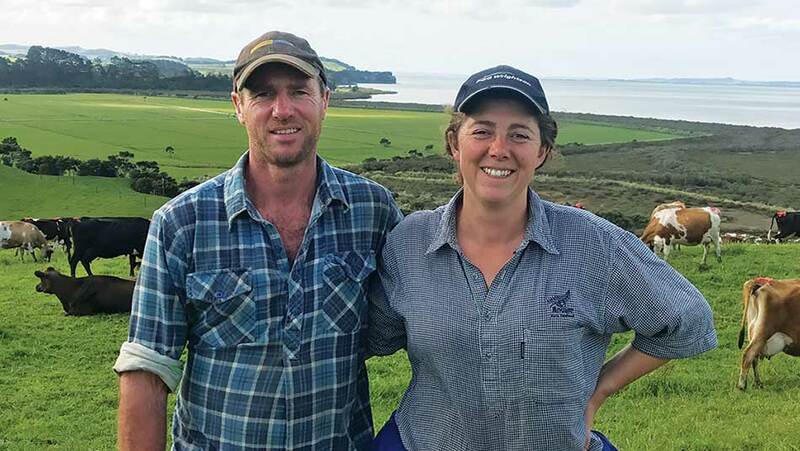 Northland dairy farmers Don and Kirsten Watson have set an ambitious pasture and crop eaten target – and they’re on track to hit it. When Don and Kirsten bought their South Head dairy farm in 2017, they set a short-term goal to operate a business with farm working expenses under $4 per kilogram of milksolids. To achieve this, they aimed to reduce their supplement use and increase their pasture and crop eaten to 12 tonnes of dry matter per hectare (t DM/ha) from 8t DM/ha. To help hone their pasture skills and source local knowledge, the couple joined DairyNZ’s Tiller Talk programme (dairynz.co.nz/tillertalk). This provides a forum to share information and get advice on pasture and feed management. “Because it is a small group of quite knowledgeable and skilled farmers, they add some real value, especially to us, because the Tiller Talk program fits with our farm goals. We don’t need to learn everything the hard way through trial and error,” says Don. Their 115 ha (effective) farm is situated on Kaipara Harbour, on young marine clay. Kikuyu typically dominates their summer pasture. In their first season Don and Kirsten focused on improving paddock contour and drainage, and increasing summer feed quality with clover and crops. By February this year they were on track for about 11t DM/ha pasture and crop eaten, which has helped reduce their farm working expenses. Make clear goals around pasture eaten and financials. Benchmark using DairyBase (dairynz.co.nz/dairybase), the Pasture Potential Tool and/or local farms. Monitor pasture weekly and use a feed wedge. Adjust rotation length to manage average pasture cover. Understand feed supply curve and cow demand. Keep getting the little things right. Grow more pasture – adjust rotation, optimise nitrogen, good pasture renewal practice. Utilise more pasture – reduce supplement, manage pre-grazing height. Be confident to try new things. Collect and use data to measure and evaluate success. Ask for advice from other farmers. Use experts – Don and Kirsten used their Tiller Talk agronomist. Use DairyNZ’s Pasture Potential Tool to compare your own pasture and crop eaten value with similar farms in your area. By calculating a pasture eaten figure, you’ll be able to assess whether you’re getting the most out of your pasture.